My latest Comics Candy review column is now live over at totalscifionline.com, featuring such titles as Fables #94, Kill Shakespeare #1, Seige: Loki and Turf #1. You can check it out here. Ah, the pace of the modern world. It leaves me breathless. 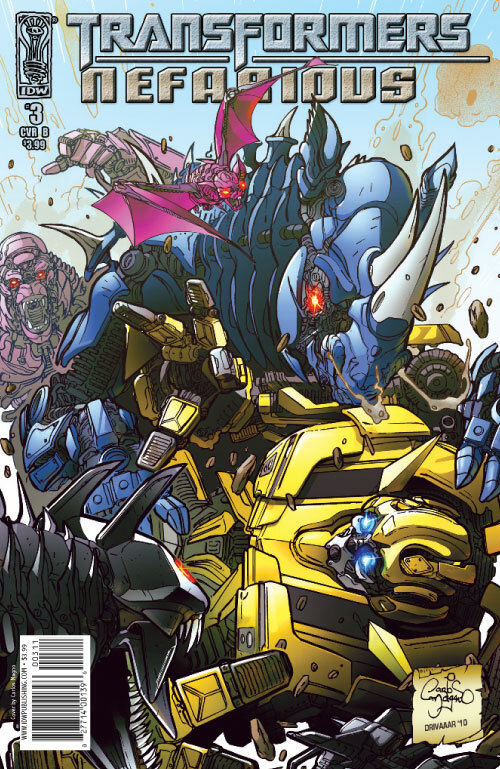 No sooner has Transformers Nefarious #3 hit the physical world of comic book stores than the virtual version explodes onto Playstation’s PSP console! So now there’s no excuse not to read the official comic book sequel to Transformers: Revenge of the Fallen. So there! You can find it here. A shade late in the day (I blame the bank holiday), a heads up that the third issue of Transformers: Nefarious (the official comic book sequel to Revenge of the Fallen) hits stores this week (today, Wednesday 5th May in the US, probably Friday 7th in the UK). What can you expect from this latest instalment? Well, the focus falls on Bumblebee, who’s charged with getting the captive Soundwave into protective custody. No easy feat this, as Soundwave’s mini-militia is dead set on busting him loose. Just how far is Bumblebee willing to go to see the job done? Also in this packed issue, Director of National Security Theodore Galloway gets the sharp end of the Initiative as he probes their mysterious operations at the old Sector 7 base and Major Lennox crosses swords with Optimus Prime over his handling of the Soundwave takedown. And look for another movie TF character making their comic book debut (in the US at least) this issue! The mystery deepens! Story is by me, art by the supremely talented Carlos Magno. You are currently browsing the simon furman blog archives for May, 2010.